ABSTRACT: Next generation telecommunications technologies have captivated the market but ecosystem participants should be cognizant of the shifting landscape and potential impacts. At the same time, the perception that a 5G rollout is impending should be placed into context – despite idealized scenarios, deployment is likely to be evolutionary, as opposed to revolutionary. 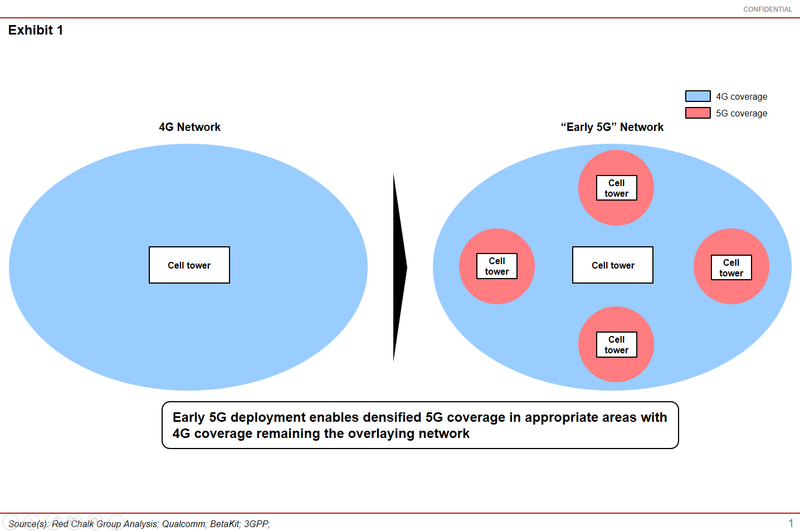 Through this research snapshot, we highlight a generalized timeline and roadmap for 5G deployment and consider potential implications for relevant industry participants. After much speculation, consumers finally have a glimpse of 5G emerging from concept to true development and implementation, as major MNOs have commenced nascent testbeds nationwide. As official standards have been determined for the next generation’s technical specifications, many project a generational transition akin to the 3G to 4G transition. However, when considering the implications of the existing infrastructure as well as technical barriers that alter the traditional network implementation, a protracted progression is more likely. Critically, MNOs are actively implementing these technologies to not only increase overall network capacity but also intertwine their development paths with 5G deployment to facilitate ease of transition. The generational progression from 2G to 3G and then 4G/LTE represented true technology shifts (e.g., OFDMA) with comparable speed improvement requirements. 5G, while still assigned with speed requirements, differs in that improvements are centered on spectrum/channel optimization and high frequency usage, which will indirectly increase network output. From an implementation perspective, these standards imply a period of select deployment, deemed the “Early 5G” phase, where 5G will co-exist with 4G networks. 5G standards rely on high frequency band usage, which enables more concentrated, faster data relaying, but has certain range limitations and penetration challenges that will affect “Early 5G” deployment. Ultimately, there is a question as to what a newly segmented 5G rollout timeline means for relevant industries, or more specifically, what implications do an “Early 5G” phase pose? The benefits of a 5G plan, whether partial or complete, are well defined for certain industry players like network carriers (MNOs), handset OEMs, and software/cloud infrastructure providers, who have offerings that are directly enhanced through the next generation’s technical specifications. Indirectly, however, certain players, particularly those within the media and entertainment ecosystem as an example, could gain from having an improved channel of distribution (i.e., premium content creators). Alternatively, some industries could be placed at a disadvantage as 5G approaches, primarily those using alternative distribution mediums that could become outdated or less cost effective vis-à-vis MNO delivery. 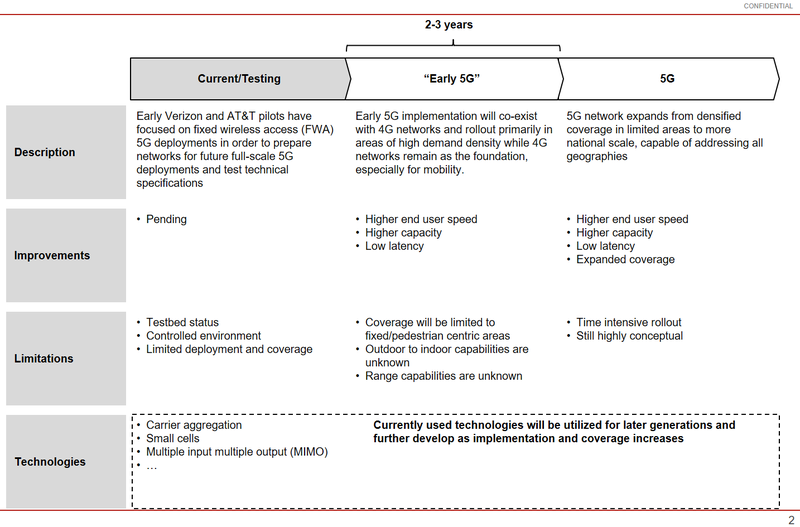 In this context, the “Early 5G” phase could be perceived as a bittersweet, “grace period.” As the gradual deployment takes place before a full implementation, “Early 5G” grants a brief period for players to better understand the capabilities of early deployment, and could potentially provide the ability to modify their value propositions to differentiate – or integrate with – 5G. What services/connectivity use cases will be enabled by 5G? How will the broader IoT connectivity landscape incorporate 5G? Will future device types and OEMs, ranging from traditional mobile handsets to IoT devices, view 5G as a single connectivity layer (along with legacy telecommunications) or part of a multi-mode environment? What industry collaboration will be required to accelerate or facilitate the transition to 5G? In what ways can players negatively impacted by upcoming 5G networks incorporate 5G into their existing product/services in order to maximize potential benefit? Which industries are most at risk?